The newly expanded Occoquan Regional Park offers the ideal physical location for this Memorial – next to the historic Lorton prison where the women were jailed – and expanded public facilities that will accommodate lectures, panels, and symposia where these critical Constitutional issues can be discussed and brought to the public. 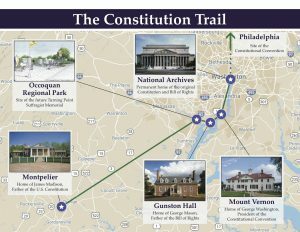 The site will become a major part of a new “Constitutional Trail,” along with the Archives in Washington, DC – home of the original Constitution; Mount Vernon – home of George Washington, president of the Constitutional Convention and the first President under the new Constitution; Gunston Hall – home of George Mason, Father of the Bill of Rights and Montpelier – home of James Madison, Father of the Constitution. The Turning Point Suffrage Memorial will be the site at which WOMEN COME INTO THE CONSTITUTION, completing the inclusion of ALL citizens in our most basic document. Such a framing of these historic sites should prove a boon to Virginia’s tourist industry and historians and educators alike.